Breakdancing started in the very late 60's and exploded in the 70's and 80's amongst large populations of city living youth. It originated in New York predominantly amongst members of the African American community. To trace the dance to other dances which it may have originated from is near impossible, but a few speculators point to the "Lindy Hop" and also the "Charleston" as possible predecessors. However, over the years breakdancing has borrowed freely from all types of dances and martial arts. You only need to watch a breakdancer for a few moments before you start to see resemblances of kung fu moves within the dance arsenal of a Bboy or Bgirl. James brown was truly the godfather of breakdancing. In 1969 he enjoyed huge success with his smash hit 'Get on the Good Foot". The dance which emerged from this song was called the "Good Foot" which was soon renamed the "B-boy". Not long after this point the DJ Afrika Bambaataa popularized breakdancing with various musical changes with impacted the breakdancing community forever. By 1977 various breakdancing crews were formed around New York City. One such crew was called the Rocksteady Crew. With Bambaataa's help the launched breakdancing into a whole new realm of success. This new form of breakdancing which emerged can be recognized from the old style of breakdancing by an assortment of new aerobic moves. head spins, hand spins and flips were now becoming common practice. Today you can see breakdancing making its way into the mainstream. Popular artists are introducing the breakdancing elements into their hip hop and pop videos and more and more dance schools are offering it as a dance option since the dance has been further popularized by and assortment of Hollywood movies. 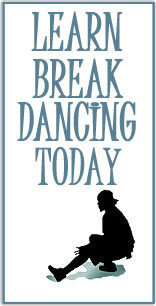 Once you are ready to enroll in our online breakdancing class then simply click on the button below.